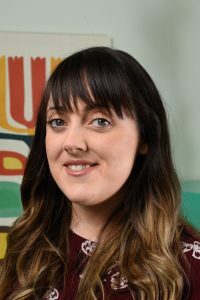 Lisa Healy studied at the National University of Ireland, Galway (NUIG) from 2005 to 2012, where she received her Bachelor of Arts in Psychological Studies and Philosophy, a Higher Diploma in Psychology, and her Masters in Applied Behaviour Analysis. During this time, Lisa worked with individuals across a variety of settings in Galway city and county; supporting individuals with physical and sensory disabilities in the community, assisting students with disabilities completing their studies in NUIG and Galway Technical Institute, and working with adults with moderate to severe intellectual disabilities in adult day services with Ability West. Lisa developed an interest in third-wave cognitive behaviour therapies, such as Acceptance and Commitment Therapy (ACT; pronounced as the word “act”), during her undergraduate studies. She completed research based on Relational Frame Theory, the theory of human language which informs ACT therapeutic practice, during both her Higher Diploma and her Masters. Her Master’s thesis was concerned with thought suppression as a method for dealing with unwanted thoughts. During her Masters studies, Lisa spent a year as an Assistant Psychologist with ACT Now Ireland under the supervision of a peer reviewed ACT trainer and Counselling Psychologist. During her time with ACT Now Ireland, Lisa was responsible for disseminating ACT consistent information to the public through social media, as well as co-facilitating and assisting at workshops for the public and professionals. Lisa co-facilitated workshops on coping with challenges such as living well with Parkinson’s disease, managing weight issues, and supporting young people to connect mindfully with their life choices, as well workshops aimed at helping people to get unstuck from the difficulties that may show up so they can move towards a more meaningful and vital life. Lisa returned to education to meet the regulatory guidelines suggested by CORU (the Health and Social Care Professionals Council) for those practicing as counsellors or psychotherapists in Ireland. She graduated with her Masters in Counselling and Psychotherapy from the Irish College of Humanities and Applied Science (ICHAS) in November 2018. Her dissertation focused on the experiences of informal family carers. Since graduating in 2012, Lisa has been committed to developing her competency in contextual behavioural approaches to mental health. She has attended over 100 hours of Acceptance and Commitment Therapy (ACT) training, including two-day advanced trainings with each of the three founders of ACT – Steven Hayes, Kelly Wilson, and Kirk Strosahl. Lisa is broadening her therapeutic competency in Compassion Focused Therapy, having completed training with Dennis Tirch and Laura Silberstein-Tirch, and Advanced Clinical Skills Training with Paul Gilbert, alongside ongoing peer supervision. In order to ensure the highest standards of psychological care, Lisa attends weekly supervision with the Lead Clinical Psychologist Dr. Roisin Joyce. Lisa’s endeavours to create a therapeutic space that is sensitive to the needs and experiences of the people she works with. She works collaboratively with people to help them develop an understanding of their experiences and explore the options available to them. Lisa works to support people who feel stuck or experience dissatisfaction in their day to day life, assisting them to make meaningful changes in the service of what matters most to them. She enjoys helping people to develop better relationships with themselves and others. Lisa’s work is guided by Compassion Focused Therapy (CFT) and Acceptance and Commitment Therapy (ACT). She works with clients to make sense of how their personal learning history combines with the evolution of the brain and body to create patterns of coping and survival that bring them to where they are today. By learning to witness the thoughts and emotions that arise within them, and noticing when these experiences begin to influence their choices, people can begin to recognize unhelpful patterns in their lives and start making more workable decisions. Lisa works with people to develop skills that may help them to be more resilient and purposeful in the face of difficult emotions and thoughts. She works from the understanding that our thoughts and feelings are not problems to be fixed, or obstacles to be removed; we become well and thrive when we learn to respond our inner experiences with curiosity and openness. Her approach respects the strength and the courage of her clients as they explore their inner world. As part of this work, people can expect to develop strategies to connect with the present moment and commit to values-driven choices, to begin to respond to their own discomfort or distress with understanding, non-judgement, and kindness, and to begin to recognize and respond to their own needs as they may wish to respond to those of a loved-one or close friend. Lisa has a special interest in supporting those who struggle with difficult relationships with their own bodies or appearance. She is interested in her clients’ relationships with food and movement, and works to help them heal those relationships and to reclaim their sense of playfulness, adventure, and joy. She believes in helping people to step out of body image struggles and into the kind of lives they would choose if their struggles weren’t holding them back. Lisa is a graduate member of the Psychological Society of Ireland (PSI), with full membership of the Division of Behaviour Analysis. She is an associate member of the PSI Division of Psychotherapy. Lisa has been a member of the Association of Contextual Behavioural Science since July 2013. Please check with your provider before beginning therapy if you wish to make a claim on your insurance policy. Psychotherapy service payments are at the discretion of each individual insurance provider. Lisa can offer appointments Monday to Thursday from 2pm. If you would like to book an appointment for our assessment clinic to be matched with the right therapist for you, please call Evidence-Based Therapy Centre on 091-727777 or get in touch via the contact page.